Garage door repairs Brisbane South, new doors, motors and springs. 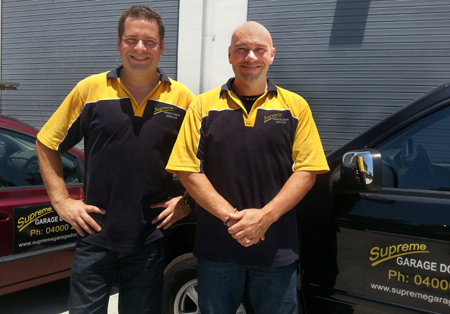 Are you in Brisbane and need a garage door repair and service? Then you have come to the right place! Hi, we are Rob and Richard, your local professionals. Do you prefer the personal attention that you only get from a local small business operator? We specialise in garage door repairs & services in Brisbane and the south-western suburbs from the CBD to Ipswich. We take care of all of your garage door requirements so whether you need repairs in Oxley, Calamvale, Springfield Lakes, Parkinson or other nearby suburbs we can provide a prompt and friendly service every time. We also have other repairs and service options. Then just give us a call and we’ll be happy to help. WHY CHOOSE US IN BRISBANE? We have almost no overheads and we don’t employ salespeople, so our prices are unbeatable! All our prices are fixed BEFORE we start work: No nasty surprises! We only use high quality, locally made products. All work is 100% guaranteed and includes a FREE service. With no subcontractors we personally install every door we sell. We give you: DOUBLE THE MANUFACTURERS WARRANTY FOR FREE on any new garage door purchased & installed through us. Throughout Brisbane,Brisbane South. Calamvale, Oxley, Springfield Lakes and surrounding suburbs, we work hard to give you repairs that you’ll love.. Contact us for a free quote on your garage door repair. *Over 1000 Garage​ Doors installed in Brisbane! * Tilt doors a ​specialty!